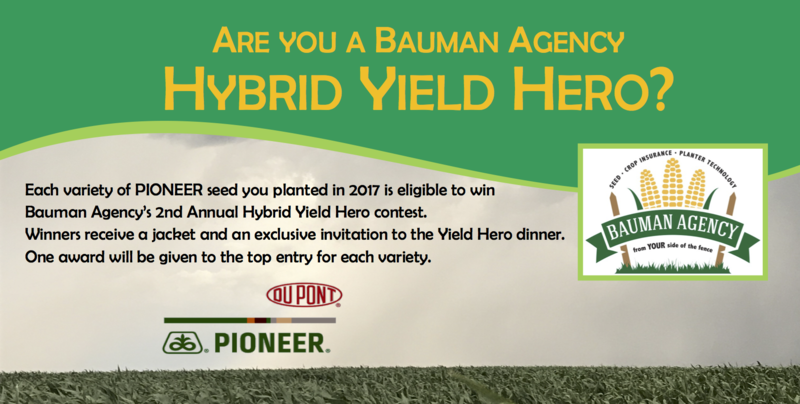 Bauman Agency is pleased to introduce our Hybrid Yield Hero contest. The yield contest is for each individual Pioneer corn and soybean product from the 2017 growing season. Each hybrid winner will be displayed on a banner that will remain on the Bauman Agency “Wall of Fame” for the year. They will also win a personalized Bauman Agency jacket and an invitation for 2 to our Yield Hero Dinner. Yield evidence must be presented as scale tickets or a contiguous yield map. Irrigated and dryland acres will be in separate hybrid divisions. Deadline for entries is December 1st, 2017. If a tie should occur, the winner will be decided by whomever submitted the most Yield Hero entries. Reminder: All entries are due at the Bauman Agency office by December 1st, 2017.